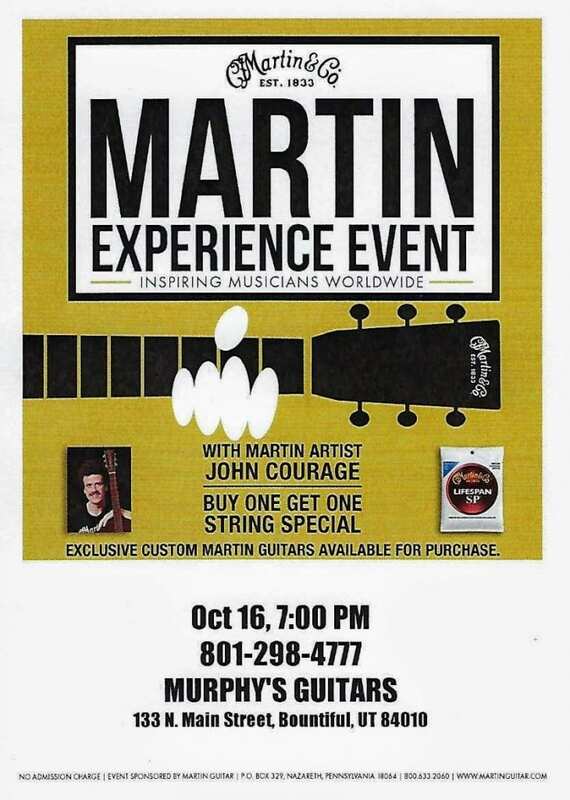 Murphy’s Gutiars is proud to host the Martin Experience Event. Spend an evening with Factory Rep, John Courage, as your guide through 185 years of rich music tradition, steeped in Martin culture and craftsmanship. Take part in a lively Q&A session, see product demos and find out why Martin makes the finest guitars and strings in the world! The night of the event we’ll be offering a buy one, get one free special on martin strings. If you buy a set of Martin Guitars brand strings, you’ll get a set of the Martin SP Lifespan strings for free! Space may be limited, so be sure to call, or visit us in store to reserve your spot for the event. There is no admission charge for the event, but all guitars demonstrated at the event will be available for sale the night of. If you’re a part of the Martin Owners Club, be sure to let a member of our staff know. All MOC members will receive a free gift courtesy of Martin Guitars. This entry was posted in Store News and tagged John Courage, Martin, Martin Experience, Workshop.